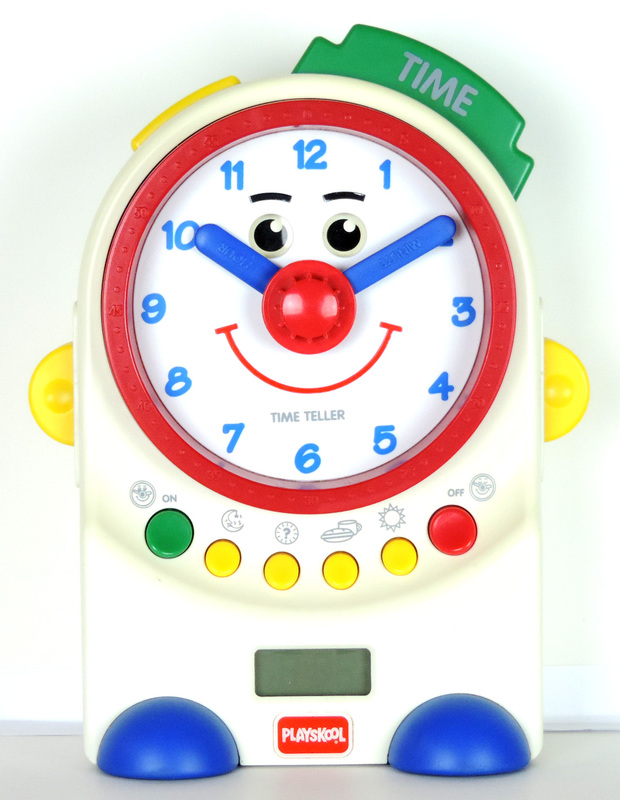 Many 'fun' clocks were created for very young children during the 20th century, to help them become familiar with the concept of time. Of course the dials were analogue back then, meaning they had a minute hand and an hour hand that indicated the time on a circular dial with the Arabic numbers 1 to 12 arranged sequentially in a circle. For older children, mechanical time-teaching clocks were available, either free standing or built into books. Some provided both the analogue time (hands) and its digital equivalent. See the colourful 'wise owl' ANSWER CLOCK with the digital time under its eyelids that could be opened by pressing on a button. Visitors occasionally remember having that one at home or at school. Then later in the century, when computer voice chips became available, battery-operated time teaching clocks were produced. These had both an analogue dial with moveable hands and a digital readout. There were two options: the time was read out through the speaker when the hands were turned to a new position, OR the typically girl's voice would ask the child to rotate the MINUTE hand (the HOUR hand follows) to a new time. If the new setting was correct, there was positive feedback to the child; if incorrect, the child was encouraged to try again. Our museum has built a collection of interesting examples of the various styles, including three voice-chip teaching clocks. Pictures are provided below. We continue to look for new additions. Check our separate Gallery called ANIMATED ALARM CLOCKS - those full-function, spring-driven, animated alarm clocks were clearly made for children by several companies during the mid 20th century. Today of course it is adults who collect them!